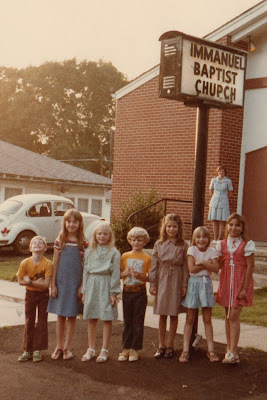 Regardless of where we went to church growing up - or even if we didn't regularly attend church - many of us have been through the doors of Immanuel Baptist Church (IBC) on Holly Street in Sheridan during Vacation Bible School in the summer months. Below are a couple of photos provided by Mandy Jester that her mother had been keeping in a scrapbook for many years. 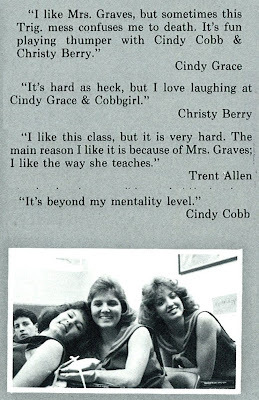 Mandy allowed me the privilege of scanning almost 75 classic photos of IBC's early days. This church holds a special place in my life for many reasons. Even though I attended a different church growing up, one of my first VBS experiences was here at IBC. Also, my wife and her family spent many, many years at this church. Then in 1992 when I did meet my wife, I attended Immanuel with her, where I first remember hearing the gospel and my need for a Savior at the age of 22. By God's grace, I was saved and several years later I responded to a desire to enter the ministry and preached my first sermon soon after - all here at Immanuel Baptist Church! 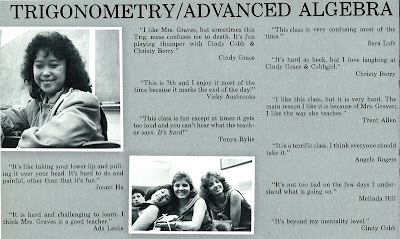 Well, I know this is a blog about the SHS Class of 88, but I wanted to post these photos because several of our classmates can be easily identified in these pics. Here you see from L to R: Allen Kelley ('89), Kim Vailes, Mandy Jester, Shawn Jester ('93), Kristy Evans, Trina Smurl ('89) and Kristy Scribner. That's Mandy's mother standing on the steps in the background. 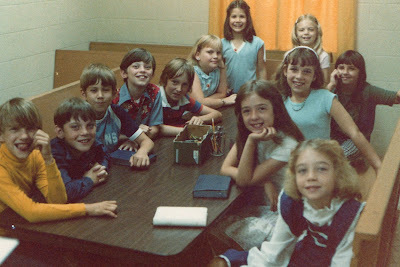 Pictured in this class going clockwise: Junior Womack, David Webb, Brett Epperson, Rodney McDougal, Paul Allen ('89), Theresa Larson, Kristy Evans, Mandy Jester, Kristy Scribner, UNKOWN, Kim Vailes and Gwen Finley ('87). You can see all the IBC Retro pictures on my Facebook page here and here (you don't have to have a Facebook account to view them). On the 11th Day of Christmas, some of our classmates & teachers share what Christmas means to them. Christmas holds various meanings. To some, it is strictly a religious holiday. Others see it as a time to get together with friends and family. SHS students and staff had the following comments about the meaning of Christmas. 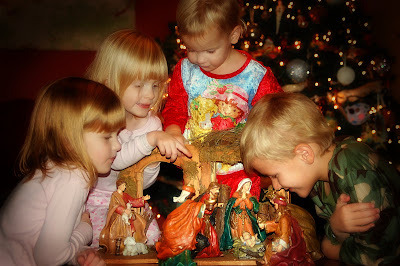 Shelli Smith – To me Christmas is a time to celebrate the birth of Jesus Christ. I also love giving gifts, but Jesus is the greatest gift of all. Mark Freiermuth – Getting money, going to court, sleeping, New Year’s Eve. Christy Eggburn – To me, Christmas means the celebration of Christ’s birth, and spending time and exchanging presents with my relatives. Andrea Winston – Christmas is a time to get together with your family and celebrate the birth of Jesus Christ. Cindy Cobb – To me, Christmas is a time that you spend with the people that you care about and celebrate the birth of Jesus Christ. Mr. Ausbrooks – We celebrate Christmas because we are happy. We are joyful because we understand that even though we are miserable, rotten individuals, we have been given another chance. We are redeemed, and it is through our Lord Jesus Christ that we live and love. The birth of Jesus is the greatest event of all time because it is the manifestation of God’s love for us. 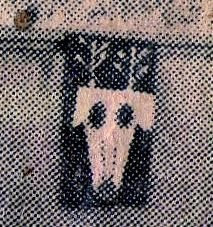 We recognize that our mortality or lack thereof rests on the stand we have taken with this Man. We are happy and thankful for Christmas. Mrs. Graves – To me, Christmas means family being together, seeing friends, enjoying watching small children – watching as they get caught up in the excitement and the wonder of it all. Mrs. Kay Gillis – Most importantly to me, Christmas is the time of year to stop and celebrate the birth of Christ. It is a time to be thankful for all my many blessings and a time to try to help someone less fortunate than myself. It is a time to get together and enjoy each other’s company. It is a time for me to watch my children being children. They can wish and dream, and just enjoy being young as they wait for Santa Claus to bring them an incredibly long list of toys. It is a time for school to be out so that we can enjoy the season, and to celebrate the season to its fullest. So... what does Christmas mean to you? Here's a few various articles from the Sheridan Yellowjacket during the month of December. As Christmas gets closer (there are only SIX shopping days left), one wonders what to buy for others. For some of us, the problem is letting others know what we want for Christmas. A recent informal poll of SHS students revealed that, of 75 respondents, 80 percent want a car for Christmas. Other gifts in order of preference include clothes (66%), jewelry (52%), and money (44%). 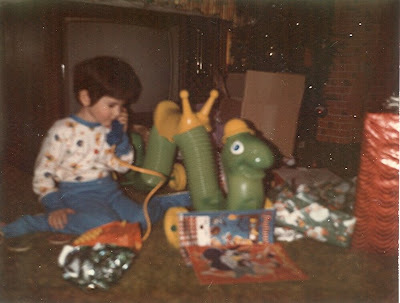 Some other gifts mentioned were stereos, waterbeds, cameras, VCR’s, and toys like Puff-a-lumps, Mr. Game Show, Noid dolls, and Gumbys. The top five gifts a guy would give a girl were kittens, jewelry, perfume, stuffed animals, and fur coats. The top five gifts a girl would give a guy were a steering wheel and floor mats, Polo, clothes, and a billfold. Remember these fun features from the Yellowjacket? This first one is from December '88. 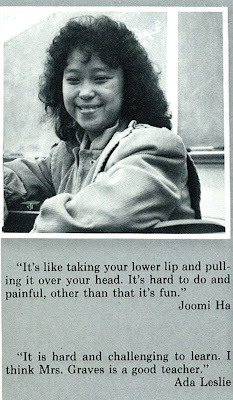 This one is from December '85. 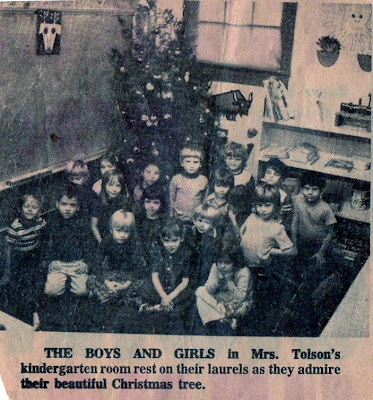 Below are a few pictures of some of our classmates celebrating Christmas morning as a child. Today, many of us are the parents setting out toys for our children. Let's hope they look back on their childhood as fondly as we do. 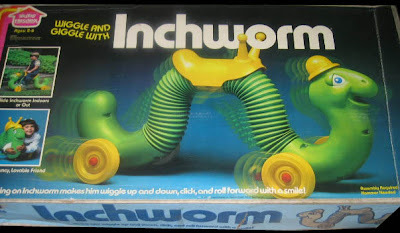 Be sure and ask Melissa Nesbitt why her hair was so short in this Christmas pic of her kneeling next to the classic "Inchworm" riding toy by Hasbro. See some cool pics & the original commercial here, where I borrowed the pic below of the original box. 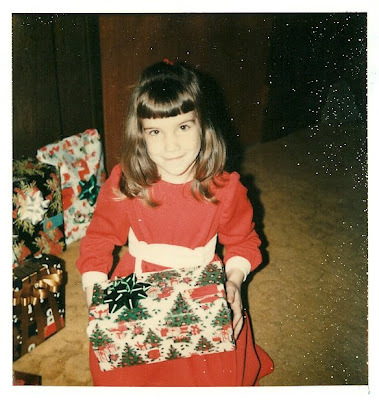 In this photo is Vicki Ausbrooks Fletcher opening one of her wrapped presents. In the immortal words of Pedro, I must say "I like her bangs." Um... I'm not sure who this guy is... but I'm glad he finally received some dumbells. Notice on the floor behind him: the game of Boggle and a Rubik's Revenge. 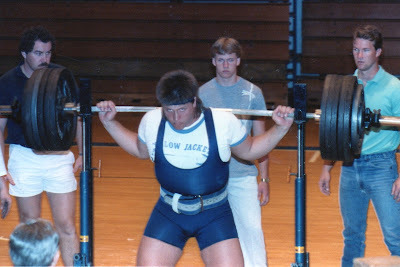 Also notice below his right knee: one ugly pullover. 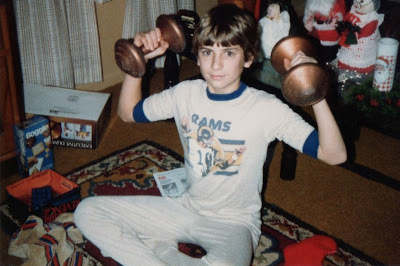 Finally, notice the keen foresight... here is a die-hard Rams fan... back when Kurt Warner was only a year younger and the team hadn't left LA yet. We all have plenty of childhood memories, like the Christmas parties at school. I think it was Mrs. Wood's first grade class that all drew names to exchange gifts with another classmate. I can't remember if Bryan Tygart was the giver or receiver of the nerf football, but it was wrapped without a box in metallic green paper, so we all knew what it was by it's obvious shape. 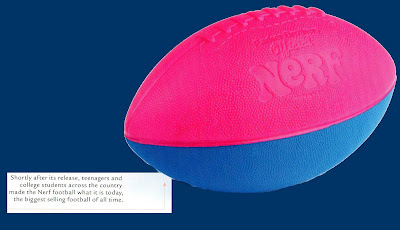 BTW, that Nerf football remains the "biggest selling football of all time." This wonderful piece of toy trivia comes from a neat guy named Tim Walsh and his book, Timeless Toys - which sets prominently on the coffee table in my home office. After the new year begins, I'll be posting some trivia questions taken from Tim's book - some of which the answers have already been posted on this blog (remember what the best selling toy is - EVER?) Stay tuned! On the 8th Day of Christmas... make your wish! It's simply amazing what you can find on the internet these days. 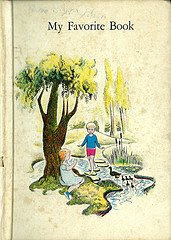 All the images below were taken from a website I recently discovered called WishbookWeb.com. These guys are doing a HUGE service to those of us who love to live in the past. 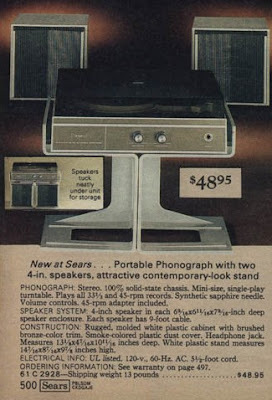 They are in the process of scanning vintage department store catalogs and making them available to the public for online viewing. Ok... maybe I'm the only one who gets excited about that kind of stuff. Well just take a look at some of the pics below and I'll think you'll share my enthusiasm. 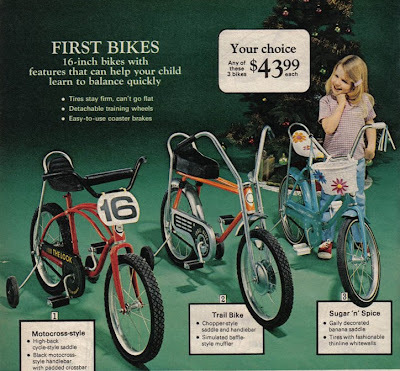 Now just think about this... remember looking through those thick Sears Wishbooks every year as you made out your Christmas list? Well, these are the VERY SAME CATALOGS that we used to peruse! Isn't that just crazy?! Ok, still not excited? Just take a look. 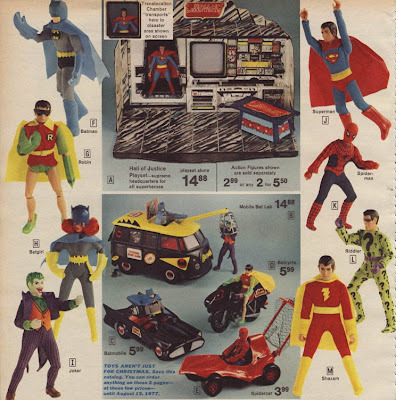 Some of these toys are what our classmates asked Santa for over 30 years ago! Banana seats and flowery baskets. 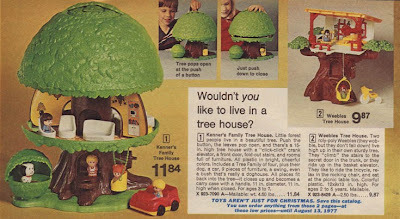 How many of you had one of these waiting beside the Christmas tree? Here are the dolls that Jeri Suttle and Angela Rogers put on their list. 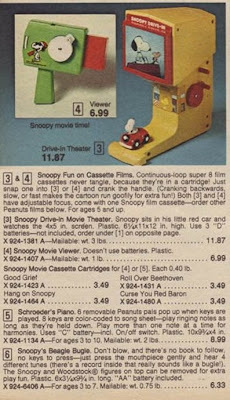 Phillip Clifford asked Santa for this Snoopy Drive-in Movie Theatre. Wouldn't you? I would did. 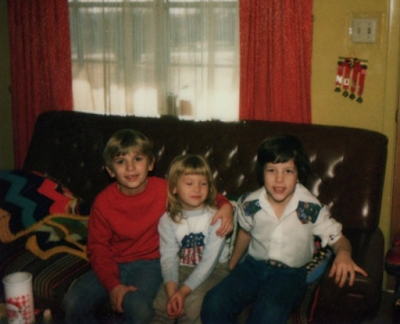 In 1976 we were probably wearing Sesame Street clothes. 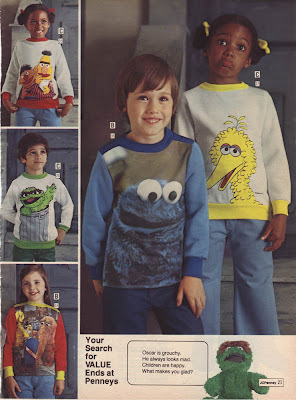 I'd love to have that red-sleeved shirt with Snuffleupagus on it. Um... for my kids, of course. 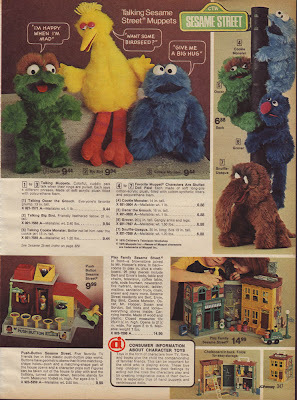 Click to enlarge these Sesame Street toys. I actually have the Fisher Price Sesame Street Playset decorating my office at work. Got it for a steal at a yard sale... and they're going for no less than $75 on Ebay. 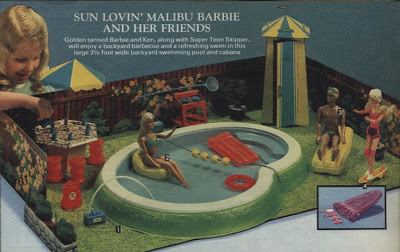 Any of you gals get a Barbie Swimming Pool? My sister did. I must admit that I wanted to play with it. Notice the dude sitting under the umbrella... that's not Ken, it's Luke Skywalker (another one of my sister's gifts that I was jealous of). 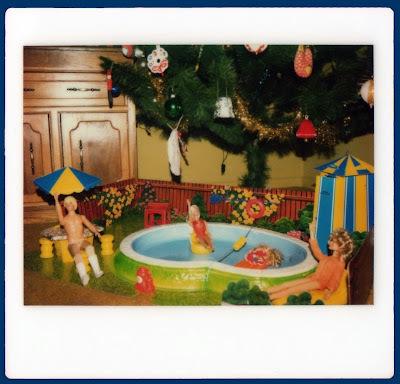 Oh - and check out the Christmas tree... see the clothespin soldier ornament I featured on the 6th Day of Christmas? I have a picture of me with these Batman & Robin dolls one Christmas morning. This was back before they went & messed with the cartoon characters & went all Justice League United. This is how I'll always remember my Superfriends. 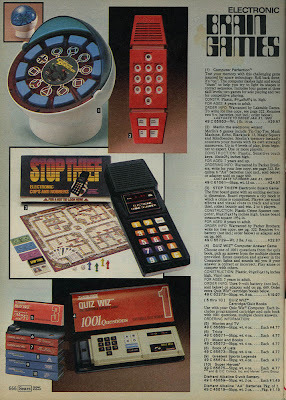 The two ads above mark the beginning of the electronic game era. That's right - you're looking at the forerunners of PSP, Wii and Nintendo DS. 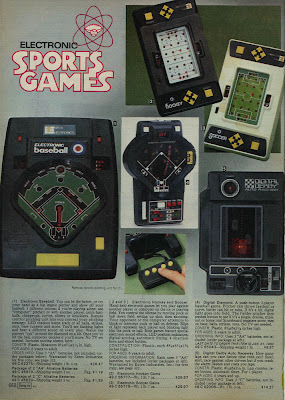 I had Merlin along with a basketball, baseball and football electronic game. It literally hurts my stomach to think that I no longer have these. I found a mint-in-box Merlin game today on Ebay for $132! For some reason, my sweet wife didn't share my excitement. So, if any of you are wondering what to get me this year... just sayin'. I hope you enjoyed this 8th day of Christmas. If anything, you learned that it sometimes pays not to throw ANYTHING away... you never know when it'll be a hot item on Ebay. Be sure to visit WishbookWeb.com and see Wishbooks from other years during the 70's & 80's. On this 7th Day of Christmas you're really in for a treat! In December of our 11th or 12th grade year, Trent Allen and I were asked to do a live radio program for our church on Sheridan's very own KKDI (there's a four letter word I bet you didn't wanna hear again!) The Methodist Church sponsored a program called "The Word in Music" and for this Christmas program they thought they'd try to do it live... and they asked a couple of teenagers... and I have the recording! I've just taken a few 60 second clips of each of us to give you some idea of how the program went. Enjoy! This first clip is Aaron telling the story of "Diane" as she awaits the second coming of Christ. Here is Trent telling of how a pregnancy reminds us of our anticipation of Christ. Suffice it to say that with all my audio editing capabilities, I had to do nothing to give us those southern accents! Here's Aaron talking about a boy named Jimmy. During this clip, you'll hear Trent stumble over his script and a few seconds later, he almost loses it while trying not to laugh. I'm sure I wasn't doing anything to encourage this. This clip is Aaron ending the program and giving the program credits. And Trent is heard one last time giving a "tag" for the program. Trent & me (and little sister), circa Christmas 1978-79. Way before our career in radio ministry. Check out the Christmas craft hanging on the chalkboard & seen above. I remember making this reindeer... with Q-tips for antlers... probably cupcake papers for eyes & lots of construction paper. I did some digging around and couldn't find many of the crafts that I thought I had, but I did find a box of old Christmas ornaments from my childhood - many of which were hand-crafted. 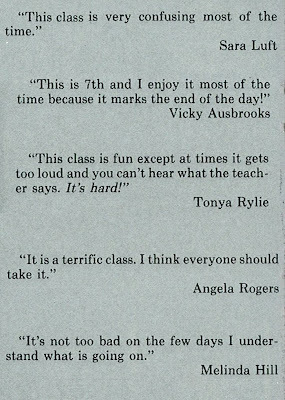 I'm pretty sure we made or received all of these during our school years. It's possible that one or two were made at church, but I'm pretty sure they all came from school. The back of this 3 inch tall stocking is mesh, probably revealing the candy treats inside. These apples look to be a gift from one of our teachers. I have vague memories of when I made this... but can't remember when. I wanna say it was a cub scout project, now that I think about it. Q-tips were made for crafts! We saw Q-tip reindeer antlers earlier, and now they show up as drumsticks. Oh the joys of being a child during Christmas! If you have children, be sure to make their memories as precious as ours are. As Christmas rolls around once again, letters to Santa begin filling the post office to be sent to the North Pole. 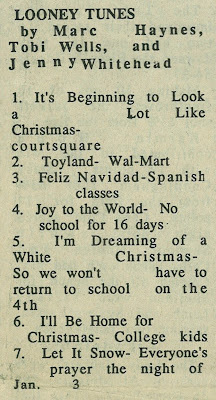 Sheridan High School seniors may consider themselves too old to be writing to Santa in 1987, but here are a few of the letters written to the jolly old man in 1976. These letters are taken from the Sheridan Headlight of December 25, 1976. I’m going to have a very nice Christmas. 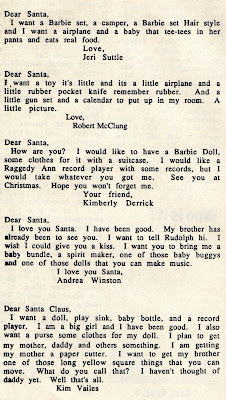 I want a lot of presents like Barbie clothes, an iron and a bicycle. I have been very good. Bring Nancy and Papa something good for Christmas. My name is Angela Rogers and I am five years old. I have been very good this year. I would like to have a baby doll that crawls and walks or one that kisses, a record player and a watch. I want a bicycle and a doll and a little kit with lipstick and stuff. That’s all. I want an ice Bird, a thing that can make pizza, a piñata, a G. I. Joe, a G. I. Joe suit and a motor cross bike. Just the parts. I am good most of the time. I want some Walkie Talkies and Snoopy’s Drive-In Movies. I’ve been a good boy. I wish it would be a good Christmas. 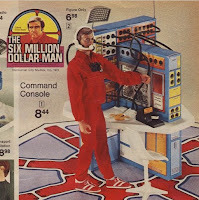 I want a play Six-million Dollar man doll. I want a Barbie set, a camper, a Barbie set Hair style and I want a airplane and a baby that tee-tees in her pants and eats real food. I want a toy it’s little and it’s a little airplane and a little rubber pocket knife remember rubber. And a little gun set and a calendar to put up in my room. A little picture. How are you? I would like to have a Barbie Doll, some clothes for it with a suitcase. 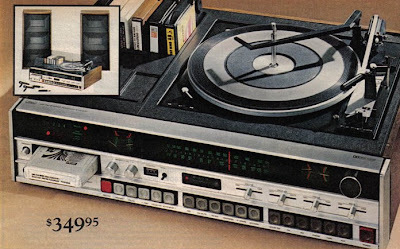 I would like a Raggedy Ann record player with some records, but I would take whatever you got me. See you at Christmas. Hope you won’t forget me. I love you Santa. I have been good. My brother has already been to see you. I want to tell Rudolph hi. I wish I could give you a kiss. I want you to bring me a baby bundle, a spirit maker, one of those baby buggys and one of those dolls that you can make music. 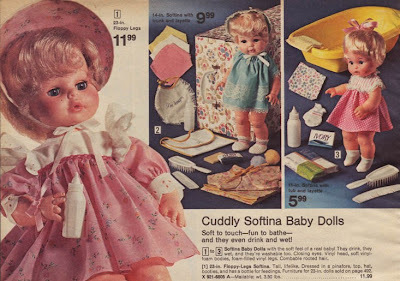 I want a doll, play sink, baby bottle, and a record player. I am a big girl and I have been good. I also want a purse some clothes for my doll. I plan to get my mother, daddy and others something. I am getting my mother a paper cutter. I want to get my brother one of those long yellow square things that you can move. What do you call that? I haven’t thought of daddy yet. Well that’s all.